I will have your accounting done accurately and in a timely fashion. Which gives you more time to tend to other needs of your business. Like the symbolism of the Eagle, I believe in the importance of honest and truthful principals. Life would be easier if you could concentrate on what you do best - running your business! 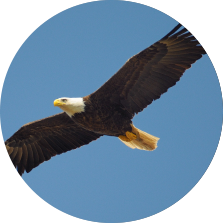 Let Eagle Bookkeeping help you make time by handling your bookkeeping, invoicing and payroll.